Turn your technical team into prolific inventors. In the patent race, there are no prizes for second place. So imagine empowering your scientists and engineers with the kind of patent acumen that usually takes years to acquire. 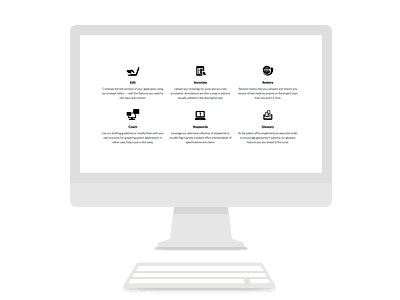 We built a browser-based solution that in minutes, lets your technical team, managers, and patent counsel collaborate with confidence. Most of the investment in a patent application is drafting. Start faster and finish faster with Patent Studio. Patent Studio provides secure collaboration for instant deployment to your entire team, including outside counsel and technical consultants. 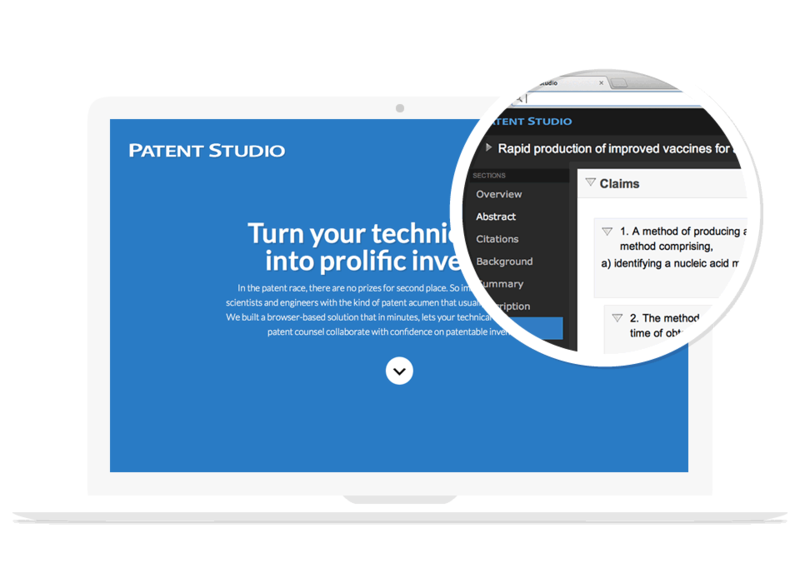 Patent Studio includes contextual help and relevant examples, matching process with content for consistent quality across your evolving patent portfolio. 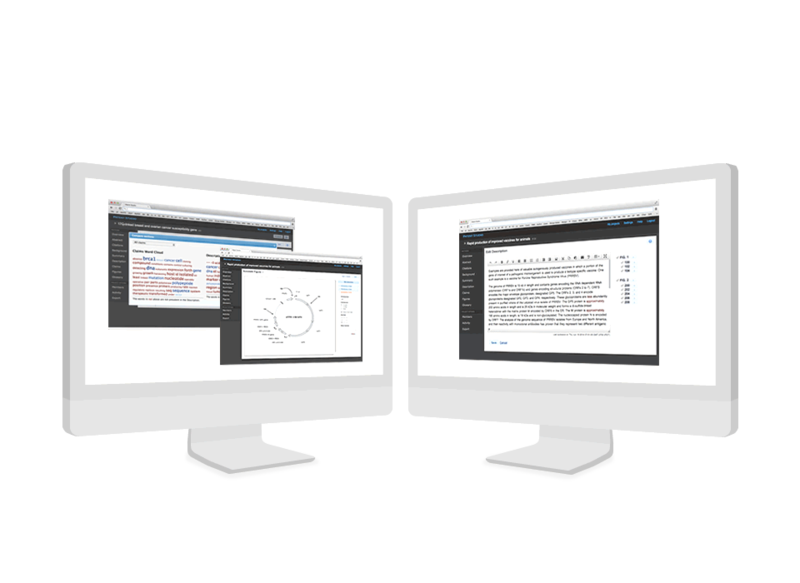 Patent Studio runs securely in the cloud, keeping projects available for immediate access. Unique features help members stay productive — and free of redline and email complications. Choose Patent Studio in the cloud to organize and leverage all devices team members use for work. A successful journey begins with a plan. Our models and roadmap help you evaluate the optimal features of your inventions so that you can make drafting decisions objectively. Don’t let patent complexity chill your creative aspirations. Our goal-directed interface presents like a published patent so that everyone clearly sees what to do next. 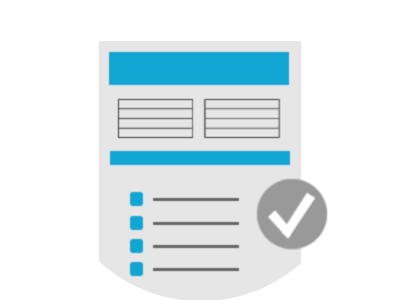 Our freestyle quality-assurance tools let you finish faster with more confidence and less burden on patent counsel. Proof that the right solution can deliver better results. 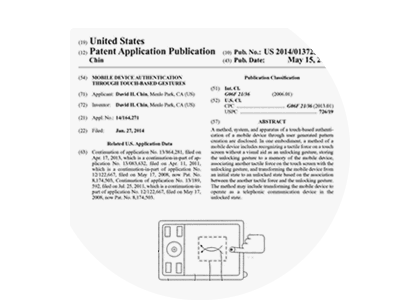 Compose the text sections of your patent application from any device --- with the features you need for fast input and revision. Upload your drawings for quick and accurate annotation. Annotations are then a snap to add and visually validate in the description text. Use our drafting guidelines or modify them with your own preferred industry practices. In either case, help is just a click away. As the patent office implements an executive order to encourage glossaries in patents, our glossary features put you ahead of the curve. Leverage our extensive collection of stopwords to visually flag legal nuances in patent office interpretation of disclosures and claims. Revision history lets you compare and restore any version of text made by anyone on the project team from any point in time.  Sales representatives are available to answer your questions Monday through Friday 9:00 AM to 8:00 PM Eastern Time.